The Kingpin (Wilson Fisk) is a fictional Character, a supervillain in the Marvel Comics Universe. 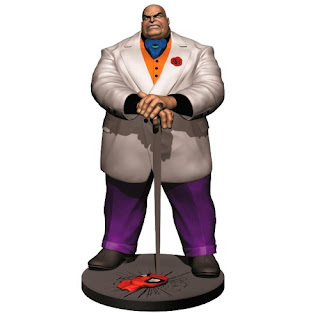 Kingpin is one of the most feared and powerful crime lords in the Marvel Universe. The character is a major adversary of Daredevil, the Punisher, and Spider-Man. IGN's list of the Top 100 Comic Book Villains Of All Time List ranked The Kingpin as #10. More about Kingpin (Marvel Comics) Character Review - keep on reading !! The name 'Kingpin' is a reference to the title crime boss in mafia slang nomenclature. The Kingpin has no superhuman powers. However, he is incredibly strong and durable, possessing remarkable strength concealed by his somewhat corpulent appearance. He has been shown to be strong enough to hurl people across a room, rip limbs from people (demonstrated under a handshake), crush a man's skull with his bare hands, leave imprints in concrete walls after punching them, and even crush one of Spider-Man's web shooters without making any great effort. Contrary to all appearances, most of his body mass is actually muscle that has been built to extraordinary size, much like a sumo wrestler and he is almost as strong as it is physically possible for an ordinary human to be. The Kingpin is a master of many forms of armed and unarmed combat, particularly sumo, jujutsu, and hapkido. He is an extraordinarily skilled martial artist, especially in sumo wrestling. His signature move is the bear hug. He once fought Captain America to a standstill in hand to hand combat. While he has been shown as being able to hold his own against Spider-Man, this is because Spider-Man has strong psychological inhibitions against using his superhuman strength against non-powered opponents, for fear of killing them. 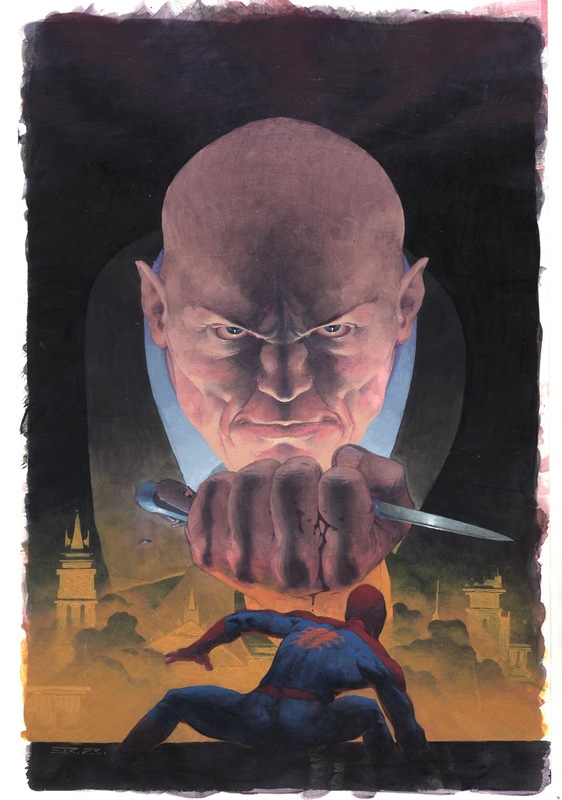 When Spider-Man went all out against Fisk after the attack on Aunt May, Fisk was easily and decisively beaten. He typically wears Kevlar armor under his clothing. Fisk sometimes carries a walking stick that conceals a laser beam weapon capable of firing a blast of concussive force sufficient for vaporizing a handgun (or a person's head) at close range; this is also known as his "obliterator cane". He typically wears an ornamental diamond stick-pin that conceals a highly compressed chamber of sleeping gas that is effective if sprayed at close range directly into his victim's face. Due to his wealth and intellectual industry, Kingpin could use far more advanced paraphernalia, but he prefers to use such things as a last resort. 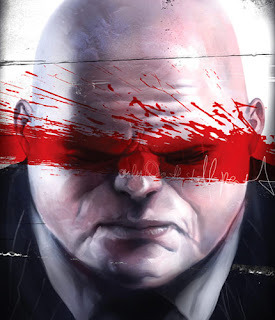 As Fisk became less Spider-Man's nemesis than Daredevil's, he became more of a naturalistic mafioso than a comic-book criminal mastermind, and depended less on science fiction-like weaponry. Aside from his remarkable physical advantages and special paraphernalia, the Kingpin is intellectually formidable and is a master tactician and a highly skilled planner and organizer. He is self-educated to the university graduate level in the field of political science. He is extremely skilled and knowledgeable in the organization and management of criminal and legal business operations. Kingpin is also a master manipulator, occasionally going so far as to lead superheroes into taking down criminal rivals that pose a threat to his position. In the live action 1989 television movie The Trial of the Incredible Hulk, the Kingpin is portrayed by John Rhys-Davies. David Banner (Bill Bixby) is unjustly arrested after interrupting an assault on a New York City subway by two thugs in the employ of Wilson Fisk, the Kingpin. Attorney Matt Murdock (Rex Smith) agrees to represent him, hoping to use information gleaned from Banner to bring down Fisk's organization. Banner and Murdock eventually learn about each other's secret lives as the Hulk and Daredevil, respectively. The pair is able to thwart Fisk's plans, but the Kingpin himself escapes. In the 2003 feature film Daredevil, Michael Clarke Duncan played the character. In the film, the Kingpin appears to be a heavily-built corporate head, but in fact he is the sole person running organized crime. Duncan signed on for the role in January 2002, though he had been attached far earlier. When Duncan was cast, he weighed 290 pounds. He was asked to gain 40 pounds for the role in order to fit the physique of Kingpin. In order to do this, he would lift weights for 30 minutes a day, and power-lifted, as well as eating whatever he wanted. Despite this, Duncan's biggest concern was that he is an African-American, while Kingpin had always been portrayed as Caucasian in the comics. He spoke on the fans' loyalty to the source material by saying "they watch movies to say, 'Hey, that's not like the comic book.' But I want them to get past that and just see the movie for what it is and see me for what I am—an actor." In the film, the Kingpin started out as an enforcer for a mob boss named Falon, in which capacity he was hired to kill Jack "The Devil" Murdock after he refused to throw a fight, leaving a signature red rose at the scene of his crimes. Years later, Fisk became a crime boss in his own right and successfully hid his criminal activities from the public. He hires Bullseye to kill Nikolas Natchios after Natchios attempts to leave his organization, attempting to frame Natchios as the Kingpin in the process. 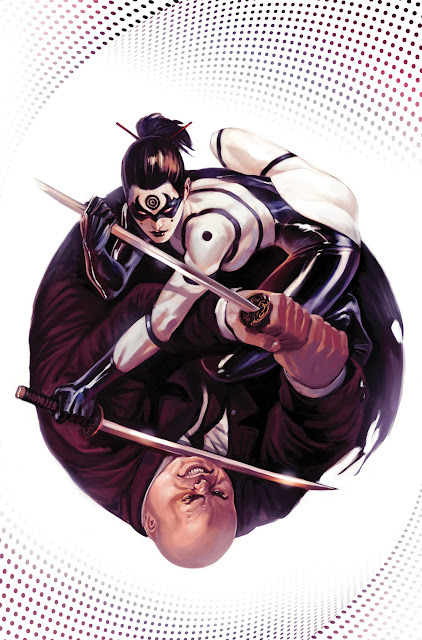 Though Bullseye is successful, Fisk also wants Natchios' family killed and hires Bullseye to kill Natchios' daughter Elektra. After he supposedly kills Elektra, Bullseye is defeated by Daredevil after he reveals during the fight that Fisk is really the Kingpin, unknowingly revealing his role in Murdock's father's death as well. In his fight with Daredevil, the Kingpin unmasks him. Daredevil then breaks Fisk's legs and leaves him for the police. Fisk swears that he will eventually get out of prison and kill Daredevil. In July 2006, Duncan showed interest in returning for the role of the Kingpin, but stated that he would not be willing to gain weight as he felt "comfortable" being down to 270 pounds. However, he jokingly showed willingness to change his mind if he was offered $20 million. Duncan suggested that the character is portrayed to have been training a lot in jail in order to become faster in combat against Daredevil, also working as a way to fit his weight loss into the story.